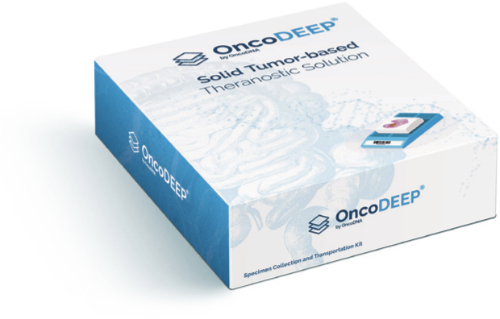 Is OncoDEEP the right test for you? This test is about helping you and your clinician determine the best treatment plan for you based on the analysis of your tumour. It looks for the presence of specific biomarkers and can identify how your cancer is likely to respond to classic chemotherapies as well as other targeted therapies and immunotherapies. It is relevant if you have Stage III of any cancer tumour – or Stage IV in any cancer other than Breast HR+ /HR2+, Colon, Prostate, NSCLC (Non-Small Cell Lung Cancer) or CUP (Cancer of Unknown Primary) For these cancers, see our OncoSTRAT&GO test – Click here. There are huge number of drugs and therapies to treat cancers, and the more your clinician knows about the exact composition and behaviour of your tumour, the better they will be able to specify the combination that will be most effective for you in terms of survival rates and quality of life. OncoDEEP results cover all therapies with potential clinical benefit – possibly including those which have not been considered for you before. It will also help determine which ones which are not likely to benefit you, so you avoid unnecessary treatments (and any associated side effects and cost). We analyse the cancer genes by deep sequencing and looking at protein effectors and any validated biomarkers. Your clinician will receive a comprehensive report covering all of these elements together with details of specific therapies and clinical trials relevant to you. We also offer OncoTRACE – a test which shows the effect treatments are having on your cancer. Click here to find out more. Usually within seven working days of receipt of your sample in the laboratory.